Think Iceland got this. 2-1 to Iceland. Come on Messi, don't let Ronaldo take the limelight! Is iceland's derby against farm foods ? Iceland are hard to play against. They're strongly underestimated. If this were Brazil instead of Iceland you'd not have said that. Proper strikers goal that, great finish. Hahaha game on, Argentina's defending is shocking there!! In the rare moments Iceland get forward Argentina are totally shitting it at the back. Iceland should be winning. Outplayed Argentina in the first half. Ronaldo a lot better than Messi. Ronaldo is 33 and Messi is 30. Despite the age gap the difference in quality is obvious. Penalties definitely not Messi's thing - misses a lot of them. Not really laaa, I'd still take Messi over Ronaldo, his overall game and the way he links with players is so much better than Ronaldo's. Ronaldo is probably a better pen taker!! So about England losing to Iceland in 2016, a team that Portugal and Argentina could not beat. Group winners and impressive in qualifying, sure hope England can avoid them if they get out the group. Rib, after a short spell of common sense you appear to have reverted back to normal. Put your fishing rod away. Argentina should have won it tbh. Shame they have such a sh*t defence! TBH I can't see share the shock here. 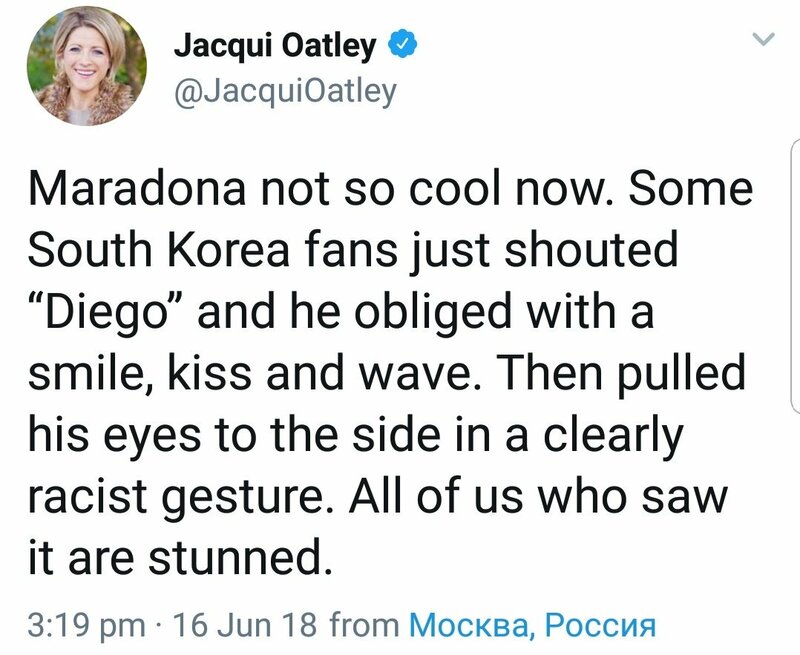 It's Maradona - not exactly a self proclaimed Saint before this incident. Who did Jacqui Oatley think he was previously?! I know I’m supposed to love Messi, but for some reason I don’t so I’m glad Iceland drew.